Alas, it's time to kiss my sweetheart goodbye for his band's yearly February/March tour run. Between the two businesses, the blog, and now wedding planning, I certainly have enough to keep me busy, but these long, cold winter partings always seem to be the hardest. 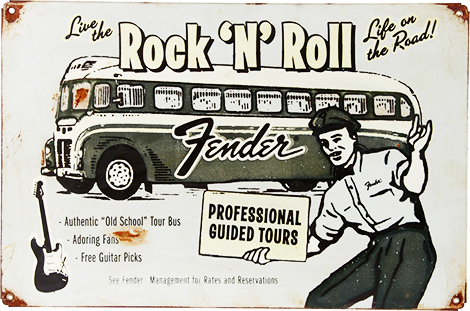 Thankfully I found this fabulous vintage Fender tour bus ad to cheer me up. Awwww! That must be so hard to have your love gone on the road for long periods like that. Hope it goes by fast!!! And that sign is awesome!!! Thanks for the kind words :). The winter tour goodbye is always the hardest, but I'm also so proud of him. And he loves his work as much as I do, so I usually have a day or so of self-pity before snapping out of it and feeling grateful that we're both lucky enough to do what we love!